Preheat oven to 450°F (230°C). Prepare pie crust as directed on package for one-crust baked shell using a 9-inch pie pan. Bake at 450°F (230°C) for 9 to 11 minutes or until light golden brown. Cool crust for 40 to 50 minutes. Once pie crust has cooled completely, spoon canned lemon pie filling into crust, smoothing out filling with a spatula. Reduce oven temperature to 350°F (180°C). In a mixing bowl, combine egg whites, cream of tartar and vanilla; beat at medium speed until soft peaks form. Add sugar one tablespoon at a time, beating at high speed until stiff glossy peaks form and sugar is dissolved. Spoon meringue onto lemom filling; spread to edge of crust to seal well and to prevent shrinkage. 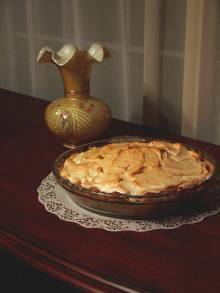 Bake pie at 350°F (180°C) for 10 to 13 minutes or until meringue is light golden brown. Cool at room temperature for one hour, or until completely cooled. Refrigerate pie for three hours or until filling is set. Serve chilled, and store any lefovers in refrigerator. I have never made a lemon meringue pie before. I wanted to try it because my mother never let me because of the issue of oil getting in the meringue. I was afraid it wouldn't froth up but after about 5 minutes of whisking it got twice as big I was happy. It worked nice for my first try it worked out real well and it tastes good too! I'm glad to be the first review, seeing as how it was also my first try. Thanks again! this recipe is easy to make and understand. also it tastes delicious and looks like a professional did it.